On September 15th, the Cassini spacecraft will have its final mission. It will dive into the planet Saturn, gathering information and sending it back to Earth for as long as possible. As it dives, it will burn up in the atmosphere, much like a meteor. Cassini’s original mission was supposed to last four years, but it has now been orbiting Saturn for more than 13 years! The spacecraft has seen and discovered so many things in that time. In 2010, Cassini saw a massive storm in Saturn’s northern hemisphere. During this storm, scientists learned that Saturn’s atmosphere has water vapor, which rose to the surface. 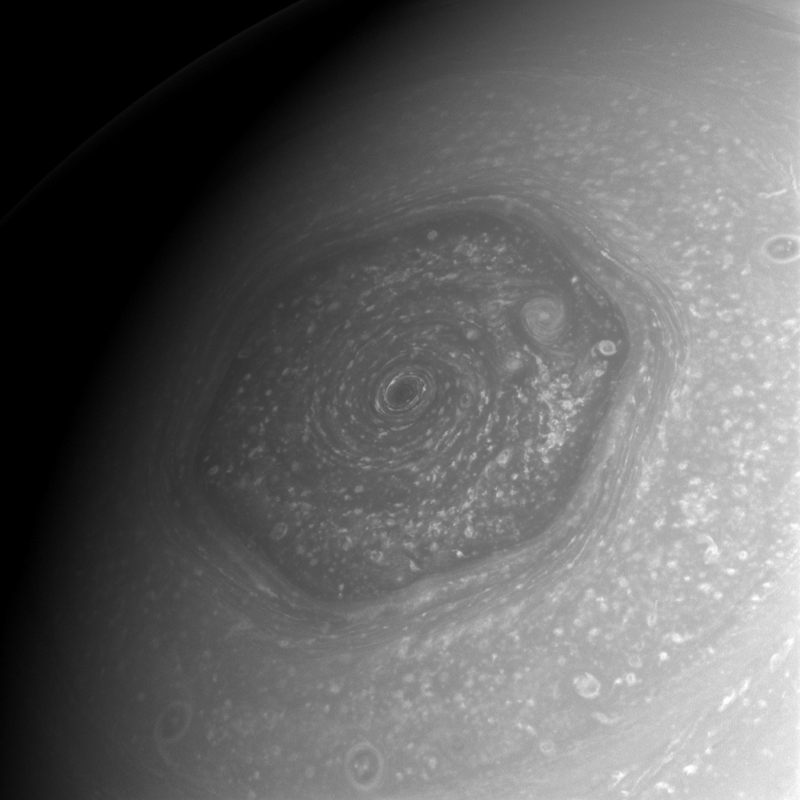 Cassini also looked at the giant storm at Saturn’s north pole. This storm is shaped like a hexagon. NASA used pictures and other data from Cassini to learn how the storm got its six-sided shape. Cassini also looked at some of Saturn’s moons, such as Titan and Enceladus. Titan is Saturn’s largest moon. Cassini carried a lander to Titan. The lander, called Huygens, parachuted from Cassini down to the surface of the moon. It turns out, Titan is quite an exciting place! It has seas, rivers, lakes and rain. This means that in some ways, Titan’s landscape looks a bit like Earth. However, its seas and rivers aren’t made of water— they’re made of a chemical called methane. Cassini also helped us learn that Saturn’s moon Enceladus is covered in ice. Underneath the ice is a giant liquid ocean that covers the whole moon. Tall geysers from this ocean spray out of cracks in the ice and into space, like a giant sneeze. Cassini flew through one of these geysers. We learned that the ocean is made of very salty water, along with some of the chemicals that living things need. If there is life on Enceladus, NASA scientists don’t want life from Earth getting mixed in. Tiny living things may have hitched a ride on Cassini when it left Earth. If these germs are still alive, and they land on Enceladus, they could grow and spread. We want to protect Enceladus, so that if we find life, we can be sure it didn’t come from Earth. This idea is called planetary protection. Scientists worry that when Cassini runs out of fuel, it could crash into Titan or Enceladus. So years ago, they came up with a plan to prevent that from happening. Cassini will complete its exploration by diving into Saturn—on purpose. The spacecraft will burn up and become part of the planet it explored. During its final plunge, Cassini will tell us more about Saturn’s atmosphere, and protect the moons at the same time. What an exciting way to say goodbye! ​This article is provided by NASA Space Place. With articles, activities, crafts, games, and lesson plans, NASA Space Place encourages everyone to get excited about science and technology. Visit spaceplace.nasa.gov to explore space and Earth science!